Are You Wondering If You Should Buy Laminate Flooring? When it comes to floors, there are plenty of styles and types to choose from. But this can be both a good and a bad thing. Of course, it allows you be flexible and select what best fits your vision. But, on the other hand, it can be kind of hard to decide what you should install. 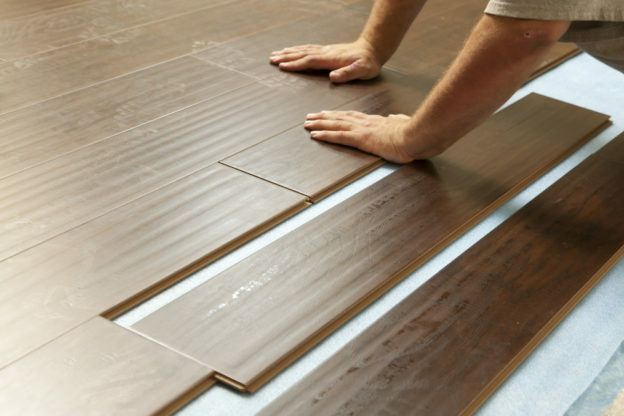 With so many flooring options out there, it’s common to get overwhelmed with it all. So, let’s just talk about one specific flooring that you might consider. Have you ever thought about whether or not you should buy laminate flooring? Well, we’ve got some information that might help. Let’s take a look at the advantages and disadvantages of this type of flooring. Bang for your buck. Everyone likes to know that they’re getting quality material when they make a purchase. If you buy laminate flooring, you’ll notice that it’s very affordable. Laminate floors can give you the look you want without breaking the bank. Laminate floors are durable. These floors can stand strong in areas where there’s a lot of floor traffic. It’s scratch and stain resistant, so it’s a great option for people who have children or pets. Also, laminate floors keep their color; they don’t fade. Versatility. This is one of the coolest features of laminate flooring. Most people who buy laminate flooring want to install it because of its many styles. Laminate flooring can be made to look like marble, wood, stone, tile, and so forth. So, you can definitely get the look of those floor styles without actually purchasing those materials. Easy peasy maintenance. When people buy laminate flooring, they’re definitely buying some easy-to-clean flooring. Since laminate is stain resistant, anything that spills on it can be removed with ease. You can sweep daily (or whenever you feel it’s necessary) to keep your floors clean. You can also vacuum laminate floors. Installation is also easy. So, if you’re a DIYer, you might want to buy laminate flooring and install it yourself. Of course, you might experience some disadvantages if you buy laminate flooring. For example, if your flooring does sustain some major damage, you’ll need to replace the entire damaged area. If your flooring does appear to be worn after a while, there’s nothing you can do besides replace it completely. Also, if you buy laminate flooring, you might be a little restricted regarding where you place it. This type of flooring is scratch and stain resistant. But, it’s not resistant to water. So, it’s not recommended for bathrooms because of the excess water, which could damage your flooring. When there is a lot of water under or on your flooring, it can cause the laminate to become warped. Kitchens and laundry rooms might work. But it’s probably better to place laminate in other, more dry areas of your home. Think You Might Buy Laminate Flooring? Now that you’ve been given some information about the pros and cons of laminate flooring, you might decide to change your floors. If you’re considering renovating your home or business, you’ll need to get rid of your current flooring. Dust Busters Floor Removal is a floor removal service that can help take care of that initial part of the renovation. Ready to get started with your flooring process? Pick up the phone and call us here at Dust Busters Floor Removal!